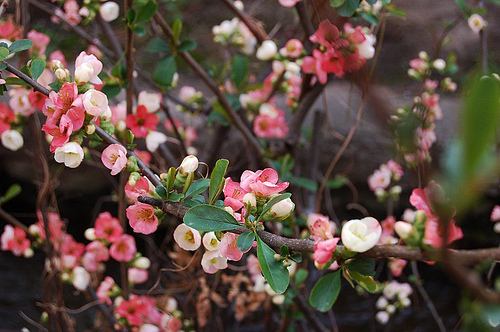 Chaenomeles speciosa, commonly known as Japanese quince, is a beautiful flowering shrub from the family of Rose. 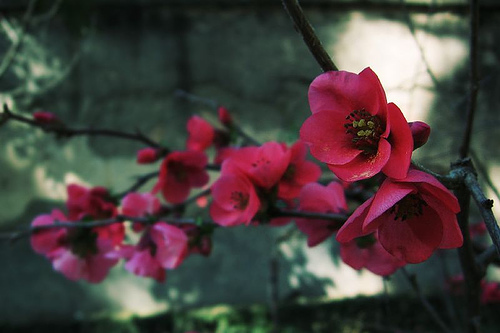 Native to China and Japan, Japanese quince is a popular plant in horticulture. It is often used for forming hedges, screens, and garden borders. Japanese quince grows as a dense and broad flowering shrub that grows 6-10 feet tall and wide. This lovely shrub is known for its beautiful cup-shaped flowers that appear in late winter and early spring. Flowers are usually red, pink or white. Flowering is followed by formation of berry-like fruits called quince. 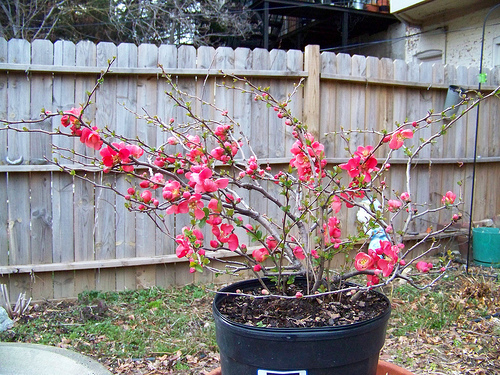 Japanese quince moderate watering and a well-drained soil. This shrub loves bright sunlight and blooms profusely when provided with ample sunlight. The plant can be propagated easily from cutting. Chaenomeles speciosa ‘Cameo’ produces double flowers of pink colors. The plant grows as a low growing shrub (4′ to 5′ tall) with bright green foliage and few thorns. Chaenomeles speciosa ‘Contorta’ is characterized by twisted stems and lovely white flowers. Chaenomeles speciosa ‘Texas Scarlet’ is another low-growing plant (to 4′ tall) with few thorns. Flowers are bright red. Chaenomeles speciosa ‘Toyo-Nishiki’ is a rather unusual form with red, pink and white flowers in the same flower cluster. Chaenomeles speciosa ‘Geisha Girl’ is a compact deciduous shrub with semi-double salmon-pink flowers borne on leafless branches in early spring.